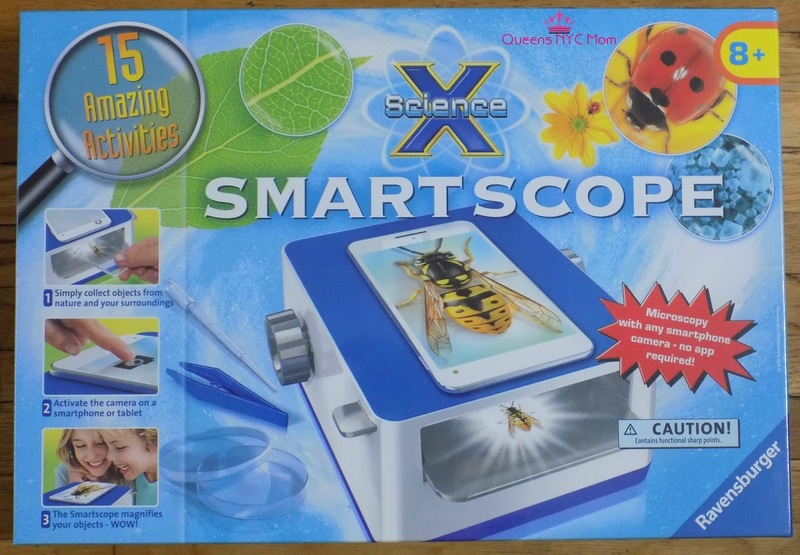 Disclaimer: I received the Ravensburger Science X Smartscope for free in return for my honest review. 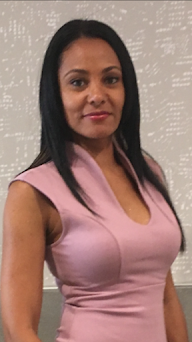 QueensNYCMom always provides honest opinions, beliefs or experiences on products reviewed. This is my personal experience using this product and is my own. We will only recommend products or services that we feel are of benefit to our readers. The disclosure is done in accordance with the Federal Trade Commission 10 CFR, Part 255 Guides Concerning the use of Endorsements and Testimonials in Advertising. If you have a product and/or want to sponsor a giveaway email Anita at QueensNYCMom(at)gmail(dot)com. Have you heard about Ravensburger Science X Smartscope? Ravensburger is Europe's leading company of games, puzzles and activity products. The company has was founded in 1883 and has been producing high quality products for over 130 years. The blue triangle is one of the most renowned trademarks in Germany. Science X Smartscope is in the category of STEM (Science, Technology, Engineering and Math). Kids get immersed in the science world with nature and bugs. Your little ones minds are opened to exploring microscopic organisms with the Smartscope. Contents: Base Plate, Housing, 2 Dials, Dial Shaft, Lens Holder, Object Tray, 2Magnifying Lenses, 2 Object Tray Rails, Lighting Window, Foam Plate, Lighting Unit, Screwdriver, 4 Screws, Tweezers, Petri Dish, Pipette, Object Holder, Cover Plate, Tablet Support, Pouch, Poster, 2 Stickers, Detailed Instruction Manual. For ages 8+ and retails for $44.99. I loved that this product can get your kids attention. You can use this product for your child's science project. You become a scientist and discover a new world through the Smartscope. This product links through a smartphone or tablet. Technology and imagination at play. Most importantly, it is in the STEM family. This innovative product is a must have for your home. science and arts and crafts kits. I haven't seen this before. It's cool that kids can investigate insects and bugs with the smartscope. Thanks for sharing this product. I used to have one of these when I was a little kid, and I loved it! I got so obsessed with looking at things through the lens, and it really sparked my interest in science. This is such a good gift for kids! This Is Cool My Kids Will Love This I Must Get Thank You! I love this! I love all things science and so do my kids. I bet my girls would be obsessed with this! This would be a great item to get for the kids. 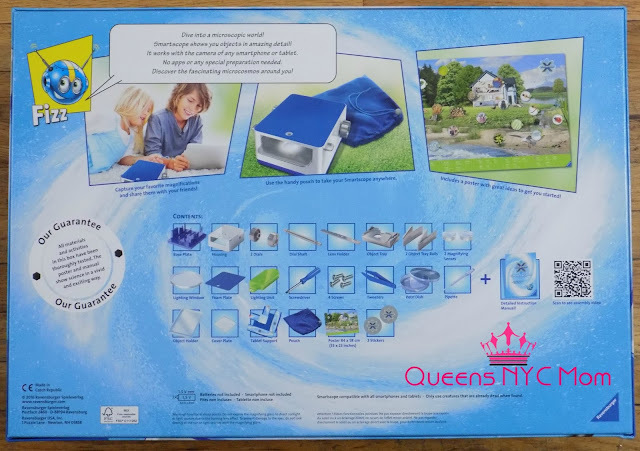 It would be great to spark their interest in STEM subjects and this smartscope will definitely help the kids to learn more about nature and the environment. What a cool way to get kids to like science. My kids loved gadgets like this when they were younger. They loved learning. This is such a great gift for the science geek in yout life or the one you want to take a bigger interest in it. Reasonable price point, too. Very cool! I love educational toys.It is important to give your child a love for science. STEM toys rock. Oh, I love this. We have a nine year old granddaughter that would enjoy it. Perfect way to get kids interested in science. This is perfect for kids who are interested in science. I love it! STEM activities are so important. Very interesting. I was never into science and I know it gets kind of lost on kids these days, too so this is a great product! This looks like such a fun option for kids, while I don't have any, my friends do and they would love this! I have never heard of this science project but it looks really fun!! I'm sure one of my nephews would be totally into it!! My boys would love something like this. They are super into exploring new things right now. I can remember playing with a microscope when I was a kid, but it was nothing like this one. I think this is a great tool to jump start young minds and get them to learn about the world around them. Oh my gosh! I have got to get this for my kiddos. I know they would love this. Sounds like a great online program! My son love science.. I have to check them out!